KIM LAWTON, correspondent: About 20 miles outside Port-au-Prince, Leogane was near the epicenter of January’s catastrophic quake. Roughly 80 percent of this city was destroyed. But at the Lamb Center Ministries Children’s Home, they’re still singing about joy. There doesn’t seem a lot to be joyful about. The orphanage’s main building was completely destroyed in the earthquake. Several staff members were killed in the collapse, although all of the 260 orphans who lived in the compound did survive. Now the children are sleeping in a tent city nearby, and they come here for activities during the daytime. Pastor Jeanot Deceus, who leads the ministry, is having a difficult time finding regular sources of food and water. He says he has faith that God will help them. He told me, despite it all, he still sees hope everyday. PASTOR JEANOT DECEUS (Lamb Center Ministries Children’s Home, speaking through translator): All of the kids is the hope of the country. LAWTON: The kids are the hope of the country. LAWTON: It’s been almost three months since what people here call “le tremblement de terre”—the trembling of the Earth. The evidence of destruction and death is still almost everywhere. But the traditional Easter message is that death doesn’t have the ultimate victory, and this Easter season many Christians who live here, and those who are working here, say they are clinging to glimpses of hope that resurrection will still come. Hope can be easy to miss in this massive tent camp of displaced people that has sprung up at the former Petionville Country Club. Some 40,000 homeless Haitians now live at the bottom of the hilly area that was once a golf course for the wealthy, and that’s just a fraction of the estimated half a million Haitians who still don’t have adequate shelter. Catholic Relief Services (CRS) is helping lead humanitarian efforts on the ground. CRS camp coordinator Niek de Goeij says getting food and water to the people has been a logistical nightmare. NIEK DE GOEIJ (Catholic Relief Services): This is about as complicated as a food distribution can get in terms of logistics. It took us a good two days to figure out how to do it, and I think now we’ve got it down. LAWTON: Because of the camp’s terrain, big delivery trucks can’t get in. They drive as far as they can, and then the supplies are transferred to smaller pickup trucks, which can maneuver their way further into the camp. When the pickup trucks get as far as they can, workers take the bags of food by wheelbarrow to the waiting families below. 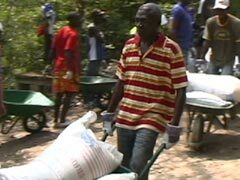 They can deliver USAID-donated cooking oil, flour, peas, and bulgur to about 7,000 people a day. Over several days, they provide everyone in the camp food rations that should last for a month. DE GOEIJ: The calculation is for a family of six a little less than 2,000 calories per person per day for 30 days. It’s not a full ration. People need to complement it with some protein and vegetables, but at least it gives them a good calorie base. 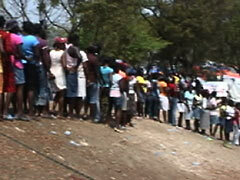 LAWTON: While a camp DJ gives instructions and offers entertainment, thousands of people, mostly women, wait in line for hours in the blazing sun to get their rations. The camp has the women receive the rations, de Goeij says, because they’re less aggressive than the men and less likely to start food riots. The camp also offers medical services, provided mostly by volunteer doctors from the US and other countries. Conditions are not ideal by any means, but still it’s considered one of the most successful camps in Haiti, and people here are grateful for it. CRS and other relief groups are also working on long-term recovery plans. But it’s hard to get to that when meeting immediate needs is still such a huge undertaking. The magnitude of it all can be overwhelming, but de Goeij says, for him, hope gets defined in the small moments. LAWTON: He says he tries to focus on what has been accomplished, not on what still needs to be done. DE GOEIJ: I come home at night, and I’m grumpy, and I’m crabby, and then I have a colleague slapping me on the shoulder and saying, you know, whatever happened today, 7,000 people are eating tonight because of the work that you did today. That helps. LAWTON: At Hopital Adventiste d’Haiti, the Adventist Hospital in the suburb of Carrefour, issues of life and death are still very much at the fore. 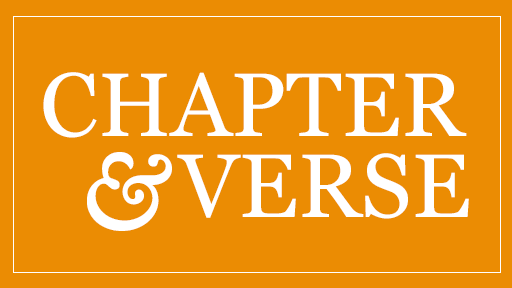 The hospital was built in 1978, but it had struggled in recent years until being adopted by Adventist Health International and the Loma Linda University School of Medicine. Within days of the quake, Adventist doctors came rushing in from the US and around the world. There’s been an outpouring of donations, and the hospital has now become one of the best facilities in the country. ANDREW HAGLUND (Hopital Adventiste d’Haiti): Unfortunately, we’re still dealing with quake-related trauma that has yet to be cared for. We’re doing orthopedic surgery right now downstairs on cases that have not been treated—fractured hip, fractured femur, so in addition there’s lots and lots of follow-up care. LAWTON: Loma Linda assistant professor Andrew Haglund is the acting hospital administrator. He arrived six days after the quake and is not sure how long he’ll stay. HAGLUND: It’s very, very difficult. You’re seeing things and exposed to things that you would never see at home, and I think we start the day with prayer, and we end the day with prayer and pray all day long for the safety and for the healing of this nation. LAWTON: With all the earthquake-related orthopedic injuries and amputations, the hospital is specializing in prosthetics and rehabilitation, and the Americans are training Haitian doctors to carry that work into the future. HAGLUND: That’s where I see the hope—that we can make a difference and that hopefully we are bringing light to this nation where hope is rare. LAWTON: The faith-based medical ministry Cure International has been supporting work at the hospital and helping to coordinate volunteer medical teams. Phil Hudson is directing Cure International’s efforts here. He too, defines hope by each person who is helped. PHIL HUDSON (Cure International): And you say regardless of this list, regardless of I’ve got 20 hours of work to do tomorrow plus whatever comes up tomorrow, it all comes back to this child is good, and they’ve been touched by the love of God, even if no one ever says anything to them about God, and that’s what does it for me. 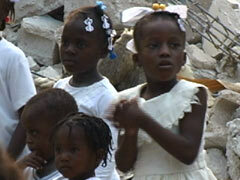 LAWTON: Hudson worries that American concern about Haiti is already starting to wane. HUDSON: It’s a shame for our country to allow something like this to exist in our hemisphere so close to our shores and it’s been a shame for years, and if we don’t stay with it it’ll be a big blot on us. LAWTON: But he’s determined to see that new life does come. HUDSON: If we only leave Haiti the way that it was before the earthquake we will not have done a good job, and so everything that we’re doing needs to be for the long term, and I am hopeful that we can leave things better than they were before. 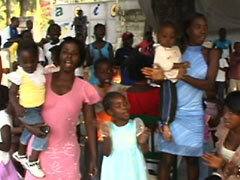 LAWTON: The Haiti Gospel Mission Community Church is about 45 minutes outside Port-au-Prince. The building did sustain some damage in the earthquake, although not severe. Church leaders say they’re not only repairing the damage, they’re going to make the church even stronger and more beautiful than it was before. Pastor Elison Bien-Aime says the earthquake has actually strengthened people’s faith. LAWTON: Pastor Elison says the support from around the world has helped his people see a new vision for their nation. BIEN-AIME: They feel the Lord has a dream for this country, and then we are not sad. LAWTON: And some signs of the new vision are already starting to take shape. As the choir practices on Monday morning, the sounds of construction are in the background. I’m Kim Lawton in Haiti.